Have You Been Charged With Selling Drugs In New York? Nassau County Takes Drug Sale Charges Seriously! FIGHT YOUR DRUG SALE CHARGE WITH AN EXPERIENCED NASSAU COUNTY CRIMINAL DEFENSE LAWYER! New York is known for many things. From Broadway theaters and skyscrapers of New York City to the scenic views of the Adirondack Mountains and Niagara Falls, the diversity of the Empire State makes it a destination for people around the world. However, these marvels are not the only thing New York is known for. New York has notoriously harsh anti-drug laws. From possession to the sale of drugs, New York zealously prosecutes those who play any role in the world of illegal drugs. While possession charges have serious consequences if convicted, the sale of these drugs can result in even more severe penalties. If you have been charged with the sale of any quantity of drugs, you will be faced with potentially devastating consequences. The Law Offices of Michael H. Ricca P.C. understands how serious these charges are. Below, we help explain what each of the New York drug sale charges mean, as well as the consequences you may face. The Empire State defines what constitutes a drug, or controlled substance, via New York Public Health Law, Section 3306. This law divides controlled substances into 5 categories, referred to as “Schedules.” These Schedules, which range from I to V, are classified based on their likelihood of causing abuse or addiction. Schedule I drugs are considered those that will most likely cause serious cases of abuse or addiction, in addition to having little to no medicinal value. Schedule V drugs, by comparison, are those that may cause abuse or addiction, but also have some medicinal value. Let us look at some examples of what is classified under each Schedule. There are several laws associated with cracking down on the world of controlled substances in New York. However, Sections 220.31, 220.34, 220.39, 220.41, 220.43, and 220.44 specifically pertain to the sale of these drugs. A violation of New York Penal Law, Section 220.31 is one of the most general drug sale offenses you can make. It also has the most lenient of all drug sale classifications. However, “lenient” is a very subjective view. We will talk more about specific punishments below. Criminal Sale of a Controlled Substance in the Fifth Degree is a Class D felony under New York law. A Section 220.31 violation occurs when an individual knowingly, and unlawfully, sells a controlled substance, as defined by the New York Public Health Law, Section 3306. This means that any sale of an illegal drug, regardless of quantity, can result in a Class D felony charge, in the very least. Section 220.34(9): one or more preparations, compounds, mixtures, or substances that contain GHB. Criminal Sale of a Controlled Substance in the Fourth Degree is a Class C felony. Section 220.39(9): a narcotic preparation to an individual under the age of 21. Section 220.41(7): methadone (360 milligrams or more). Section 220.43(2): methadone (2,880 milligrams or more). The last drug sale crime is outlined in Section 220.44 of the New York Penal Law. This Section makes it a crime to sell drugs, per Sections 220.34 and 220.39, illegal in or around school grounds and day care facilities. Furthermore, it expressly defines what areas are included in the general definition of these grounds and facilities. New York strives to keep our children safe. This law aims to reduce addiction and criminal behavior near or involving children. Violating Section 220.44 is a Class B felony. New York Penal Law, Section 70.00 establishes the sentencing guidelines for “indeterminate” felony sentences. These sentences will provide the convicted felon with a range of years for which they may serve time. Felons who are given an indeterminate sentence will become eligible for parole after meeting the minimum required number of years of incarceration for their specific sentence. However, Section 70.70 of the New York Penal Law makes a drug sale violation punishable by a “definitive” felony sentence. Definitive sentences define a specific, or fixed, length of time. Individuals who are given definitive felony sentences will not be eligible for parole for the duration of their specific sentence. To understand the full difference between indeterminate and determinate felony sentences, it is important to compare the two. Remember, as a drug sale crime, the definitive sentences will be the ones that apply to your felony conviction. In the case of drug sale convictions, you will most likely be required to submit to post-release supervision once you complete your prison sentence. Depending on your charge, this can last between 1 and 5 years. You should also note that, if you have been convicted of prior felonies, the sentences for your drug sale charges will be more severe. Whether these prior convictions were for non-violent or violent crimes will also play a role in the potential sentence for your current drug sale charges. For example, if you were convicted of a prior non-violent felony, and are now facing a Class A-I felony, your definitive prison sentence will be 12 to 24 years. If you were convicted of a prior violent felony, however, you are looking at a 15 to 30 year definitive sentence. Compared to a first time offense definitive sentence of 8 to 20 years, you can see just how drastically repeat convictions can affect the results of a conviction for a drug sale offense. LET THE LAW OFFICES OF MICHAEL H. RICCA P.C. HELP YOU FIGHT CRIMINAL DRUG SALE CHARGES! New York does not tolerate the sale of a controlled substance. A felony charge is extremely serious. It goes without saying, but a felony conviction will give you a criminal record. This can be extremely damaging when it comes to future employment, loans, housing, public benefits, voting rights, and even personal relationships. The Law Offices of Michael H. Ricca P.C. understand how stressful and overwhelming a drug sale charge can be. 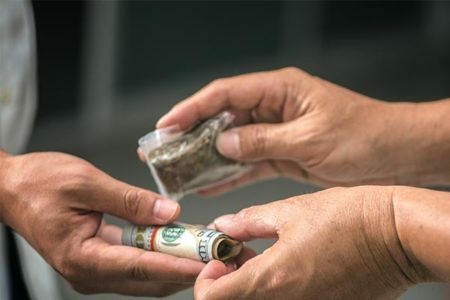 Due to our years of experience and our in-depth knowledge of New York laws, we also fully understand exactly what is at stake if you are found guilty of a drug sale. Not all cases are going to result in an outright dismissal of charges. Mr. Ricca will not mislead you regarding the reality of your specific case and potential outcomes. However, he will work diligently to help ensure you have the most positive outcome possible. Mr. Ricca will work with you to ensure that expectations are realistic while passionately working to protect your rights and best interests. In addition to this, he will diligently work with you throughout the entire legal process. This includes identifying the best possible defense tactic and preparing you for cross-examination should your case go to trial. The Law Offices of Michael H. Ricca P.C. are here for you. When you face criminal charges, the court is required to provide you with a public defender if you are unable to afford counsel of your own. However, The Law Offices of Michael H. Ricca P.C. are able to provide the attention your case deserves. Unfortunately, a public defender will be unable to provide this level of dedication. Hiring your own private counsel gives you a much higher chance of a positive outcome. If you have been charged with a drug sale, every second counts. Whether you are looking for the best possible plea deal or want to fight your charges to the end, we can help. However, that fight starts with you. Contact The Law Offices of Michael H. Ricca P.C. today for a free consultation regarding your drug sale charges.